A group Otters went over to Mallorca to race in part of the week long open water festival. They joined the Junior International teams from Canada, Great Britain and Germany as well as swimmers from all over Europe. Racing was frenetic with some good finishes given the high quality fields of the 5km and 1.5km. There were also some challenge events including a 3.8km guess your pace where the winner was the closest to their (chosen) time. Pip, Madeleine, John, Mike, Michelle and Leila all had a great time and would definitely go back. This was the qualifying event for the 19+ race at Nationals (rather than Masters). Pip Bennett won the 19+ category winning a qualifying spot at Sheffield later in the year. It was a on a very small 500m loop which meant everyone got a chance to practise their turns! Trying a bit of wetsuit action, Pip Bennett finished 2nd overall at this race just west of London. The lead changed a few times between 1st and 2nd, but the junior powered home on the final straight. Pip Bennett took a swift trip across to Paris for the weekend and competed in the combined event in the Basin de Villette. This comprised of a 5km on the Saturday and a 2km on the Sunday (there were 10km and 2km with fins options!) He finished 2 overall in the combined event and was fastest non wetsuit. Straight after the London Region Champs, Pip went to Henley for the dawn swim up the famous regatta course. He won the traditional (Channel swimming rules for trunks) event and finished 9th overall. 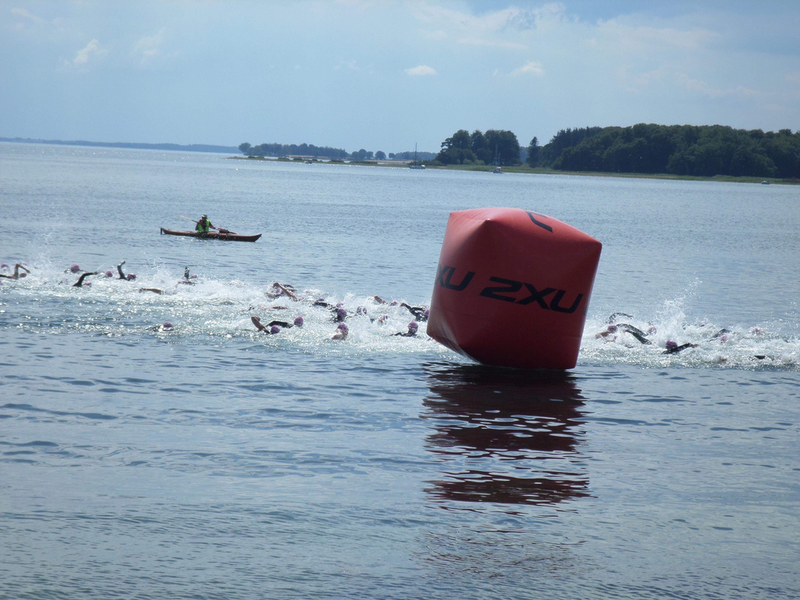 Deborah Lowi travelled to Odense, Denmark, to compete in the Aquathlon World Championships. 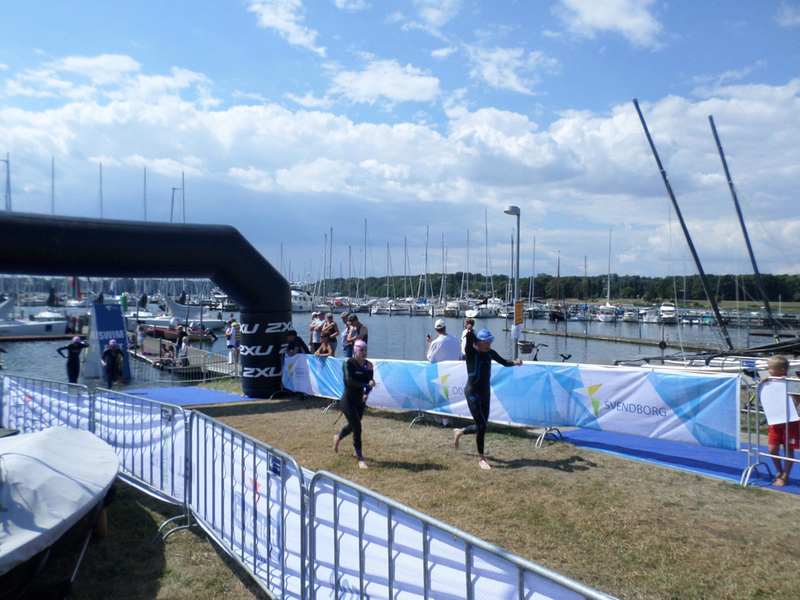 The event consisted of a 1km swim in the Baltic sea immediately followed by a 5km run. It was her first time representing the GB Age Group multi-sport team, as well as her first time competing abroad, creating a mixture of apprehension, nerves & excitement! The sea was completely filled with jellyfish, many of which were as large as dinner plates, and those who were brave enough to go for a pre-race swim course familiarisation returned covered in stings! Despite the swarms of jellyfish, Deborah made it through the race in a finish time of 38:36 (swim 15:52, transition 01:19, run 21:25), placing 6th in her age group overall and 3rd out of the GB women in her age group. jellyfish and also due to the hectic mass swim start with 70+ women all scrambling to get to the first buoy at the same time. The run was equally tough in 30-degree heat and bright sunshine, but Deborah pushed hard and was able to overtake quite a few women during this portion of the race to improve my overall position. Overall it was a great experience and she looks forward to training hard in order to improve on her performance at Europeans in October! Disappointingly Masters OW nationals were cancelled due to bad weather meaning Hayley Davis nor Pip Bennett could compete. Pip had qualified for the age-group event (19+) and finished 9th in some wet and windy conditions...exactly as it should be for open water! Doubling up after winning the Otter Mile Club Champs event the night before, Pip Bennett went down to Bournemouth for a morning race where he was fastest male and also best all the wetsuiters. An Otter until very recently, Chris Grey finished second (pictured). Final race before European champs saw Pip Bennett win overall at the Reading 3.8km. He is excited about putting all this work to use in Slovenia in September.